Rachel Smith runs a shop called iamrachel. 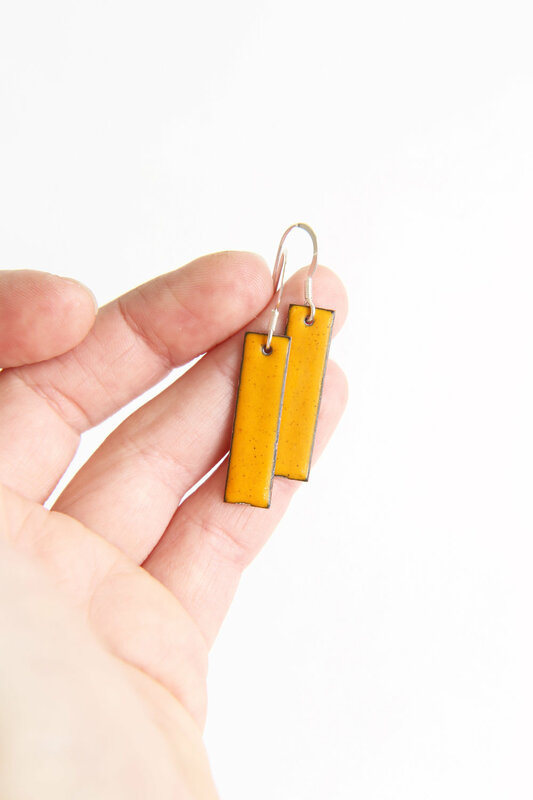 She sells colourful enamel earrings, necklaces and jewellery gifts! I was lucky enough to interview Rachel about her business and jewellery. Hey, I am Rachel from… iamrachel (yes, I know, how did I ever think of that business name?) 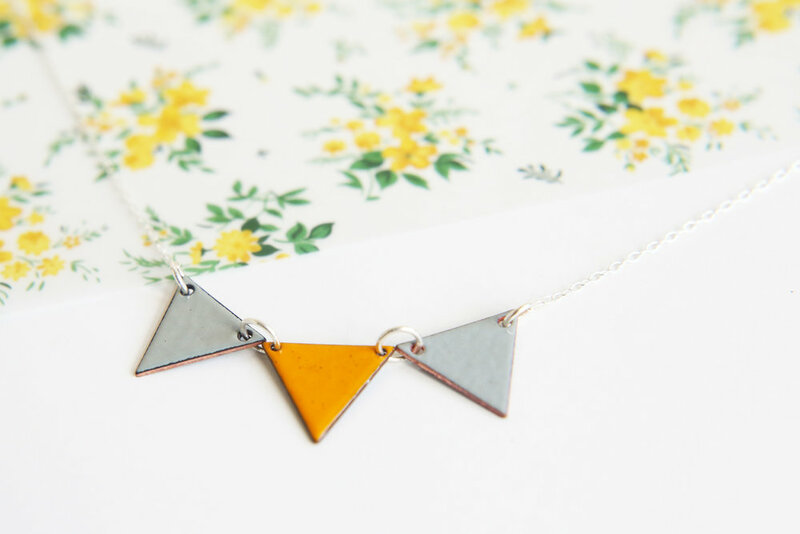 I design and create enamel jewellery and gifts from my home workshop in Somerset with the aim of brightening up everyone’s day. I am also a mum to two little people which keeps me super busy. I adore your business. What made you decide to set up iamrachel? My business actually started as a photography business. I trained in photography at school and specialised in art and photography whilst doing my teaching degree. One day my friend said “I love that, would you sell it to me?” so I sold them one of my photographs of nature and then grew the business getting more images printed, mounted and framed and selling them at fairs. I have always needed a creative outlet so whilst working as a primary school teacher I attended art based evening courses and life drawing and instantly fell in love with enamelling! I bought all the kit including a kiln so that I could enamel from home and slowly practiced applying enamel powders to copper in various techniques and styles. So much! I began just playing around with enamels. Each piece was a one off. Sometimes the colours were applied too thinly so would look scrappy but that was all part of the learning process. I began selling on Etsy around 6 years ago when not many people in the UK had heard of the platform and I knew nothing about SEO and how to take a good product shot, yes, photographing jewellery is VERY different to photographing nature! I think I received 8 orders in my first year on Etsy and since then orders have at least doubled year on year! The basic techniques were taught in the enamelling evening class I attended in Bristol which was taught by Janine Partingtin and her husband Matt, both skilled enamellers well known within the craft. As I said, When I was first playing with enamels I used to try anything and everything but now I am much more selective. I have developed a style which I would call classic and is inspired by nature, light and geometric shapes. I tend to stick to around 10 colour selections, usually bright colours but also pastel and monochrome tones. I can make one off pieces or small batch collections and now try to stick to my signature style rather than do all-sorts. Have you always been into craft design? Yes! My favourite subjects at secondary school were Art and Resistant Materials and I also choose to do the evening course in Photography. My grandpa was a keen photographer and some of his footage has been used in Television productions showing how life was in the 60s and 70s so I think this inspired me and I inherited his creative eye. My mum is also very creative, although she wouldn’t say so. She often knits hats for the children or attends some wonderful classes and we’ve recently been doing some of the Craftiosity boxes together. This is a thought provoking question! I would definitely love to attend more enamelling workshops, although there don’t seem to be many around. I would like to learn new techniques and to create some large sculptural pieces of jewellery. Enamelling requires lots of pieces of equipment. Some people use a blow torch to fire enamels however I am lucky enough to have a kiln and enjoy using it to enamel my pieces. I use enamel powders, sometimes liquids and mainly enamel onto copper but am beginning to learn enamelling on silver which is a whole other ball game! I also use tools for putting the jewellery together after the enamel charms are made. Things like files for cleaning the copper and plyers for attaching the silver findings to the enamels to make the finished pieces. All of them! Although 1stand foremost I would say my kiln. It is what makes me feel like a proper enameller and if it ever randomly switches off I have a panic! The great thing now days is that you can track on Etsy where your traffic has come from so I know that around 20% of my customers come from seeing my makes on social media and this is steadily growing. Winning the Theo Paphitis #sbs award on Twitter in May 2017 has helped to excel my business and given it more prestige as I think people like to know that you have won awards and to see your business growing. It can be a slog to keep up with all of the social media platforms but knowing that people are finding my work via these channels and are excited to do so is what keeps me motivated. I usually fall in and out of love with each platform and am particularly loving Pinterest at the moment. This is going to sound cliché but I love all of the pieces in my shop! I don’t put out into the world the pieces that I make and don’t like, unless I’m having a clearance sale. I also love making the one off pieces, the customer requests. Pieces where I apply the soft white, or turquoise enamel thinly in certain areas so that they burn out to create a variation in tones. No major plans for my Instagram, just more of the same colourful jewellery spam! Hopefully growing to reach 5000 followers in 2019, although that may be a tall order as I still have 1.5K to go! At present I don’t get too much time to enamel with having a 3 year old and a 1 year old so much of my work is fulfilling orders. The mustard yellow and mint green/ turquoise enamel are the most popular colours right now. 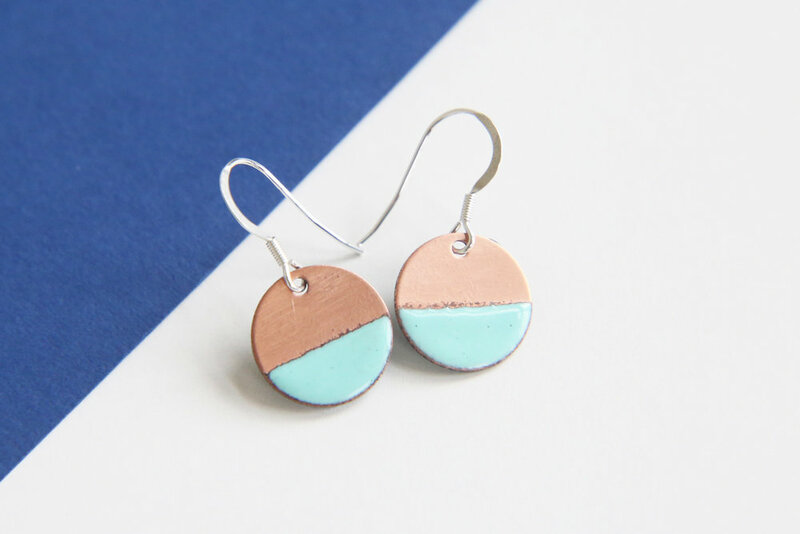 I think the rectangle earrings are the bestselling shape, as well as the ½ copper ½ colour rounds and the bright colourful rainbow bunting necklace is always a favourite. I never really get a whole day but bits and bobs of time here and there. My ‘To do’ list is always sooooo long so it can be hard to prioritise at times. The ‘doing enamelling’ side of the business is actually probably only 5% of it! The rest of the time is taken up with cleaning the copper, putting the silver chains together, assembling the finished pieces, packaging them up ready for posting, ordering supplies, writing social media posts, contacting customers, writing my newsletter, networking with other creatives, listing products on Etsy, taking stock to the shops I sell in, photographing new products, and writing blog posts like these. I’m getting excited just thinking about the answer to this! I do have so many ideas for the business and this year is the first year I’ve actually written things down at the beginning of the year and tried to put a plan together. I am launching a new product very soon, some tiny dot stud earrings which measure just 8mm so smaller than my 11mm mini dot earrings, a pop of colour for your ears! I have also been designing some small ring bowls as well as some large statement semi-circle necklaces but that’s all top secret at the moment! I will continue to sell on Etsy. The fees went up recently which some people weren’t happy about, however, I know a lot of people are searching for enamel jewellery on Etsy and that is how I get a lot of my customers, many of whom become repeat customers. Around 1/8 th of my orders go to the US so that is a big market for me. I will continue to improve my photography, learn more about SEO and update my listings in the hope that they will get seen even more and want to keep at around 100 product listings if not more for the whole year. Stick to what you love and don’t try to be anything and everything. 1. Research product shots and get them great from the start! Include a close up shot and one showing the scale of the item – a white background usually works well with most makes. 3. Don’t be afraid to wear/ show/ use your own makes and talk about them to everyone you meet. Be proud of what you do and believe that people WILL be interested, surely it’s better than saying “I work for an IT company”! I am attending my second #sbs winners event in Birmingham next week which I am sure will be as inspirational as last year, getting to see Theo Paphitis talk on stage as well as some other experts from the business world. I am also stocking a new shop in Taunton at the beginning of March 2019, Rocket and Bird, and am taking part in a Pop Up Shop in Dulwich in London as part of The Mamahood collective which I am in. As well as developing these new product ideas I am sure all of that will keep me very busy for the next few months. I think it’s good to prioritise. I know we all think we have so much to do and so little time but REALLY prioritise! Sometimes you think things are urgent which are not and, in the grand scheme of things, do not really matter. I find this particularly important to remember in the lead up to Christmas when trying to put everything first is impossible!